One of the early new year arrivals on the market here will be the new Mercedes-Benz B-Class, fresh from having received a top to bottom makeover that lifts it into an altogether higher league in terms of its design, specifications and all-round attractiveness. Since its launch in 2005, B-Class has been one of the ‘quiet achievers’ within the Mercedes-Benz fold with more than 1.5 million models sold. Whilst retaining all of the space and comfort features that appealed to owners previously, this latest version has been transformed into a truly sporty and attractive design package that is in even closer visual harmony with the new generation of Mercedes-Benz models. With a Cd value starting at 0.24, the new B-Class is the leader in its segment, even trumping its predecessor. To reduce its aerodynamic drag, its frontal area has been made marginally smaller. This is most evident when viewed from the outside. Its most striking aspect is its altogether more agile appearance and somewhat squat front end, helped by its muscular shoulders, slightly lowered roofline, and long wheelbase (2729 mm ) with short overhangs. Low-profile headlamps with LED daytime running, and larger 16” to 19” wheels add to this dynamic improvement. At the rear, its split taillights design, bumper-insert reflectors, and a distinctive black lower bumper panel with chrome trim strip create a greater sense of width and depth while a roof spoiler adds to its aerodynamic and sporty appearance. The interior, inspired by the new A-Class, is equally distinctive though noticeably different. Its newly-designed dashboard and instrument panel drops away towards the front occupants with ‘cut-outs’ that house air vents, dials and display items – three versions of which include 7-inch and 10.25-inch displays. A bold centre console with touch-based control and input system is similar in appearance to the E-Class while the optional ambient lighting comes in 64 mood-setting colours. posture. Their flatter, more comfortable profile, lower belt line and larger adjustment range increase headroom and create an even more generous feeling of space than in the previous model. Although capacity is roughly the same as in the previous model, the luggage compartment can accommodate up to 1540 litres with the rear seat folded. As ever, a comprehensive range of optional extras is available, one coming that includes a folding passenger seat-back to accommodate longer load lengths. 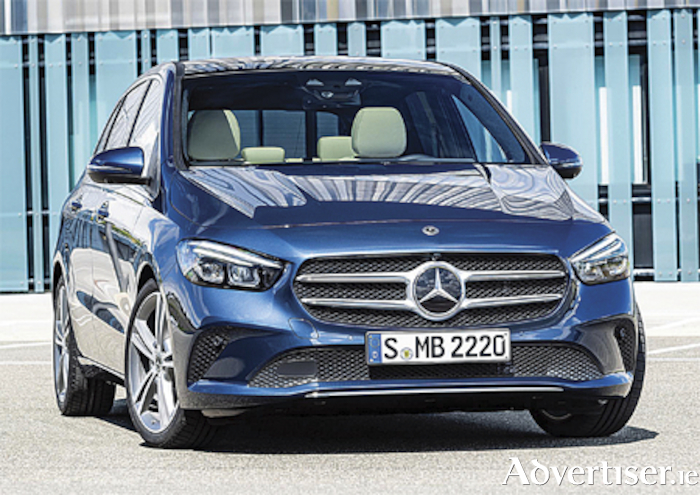 As one would expect, infotainment features are to the fore, with the new B-Class being the second new model after A-Class to offer Mercedes-Benz’s acclaimed MBUX multimedia system. Billed as a ‘user experience revolution’, MBUX has heralded a new era in ‘Mercedes me’ connectivity, employing artificial intelligence to create what they say is ‘an emotional link between vehicle, driver and passengers’. An optional head-up display that projects important driver information on to the windscreen, standard touch screen control, a high-resolution widescreen cockpit, navigation display with ‘augmented reality’ technology and intelligent voice control with natural speech recognition are amongst its many features. The ‘Mercedes me’ app connect services include navigation functions based on vehicle tracking and car-to-place communication. Parked vehicle locator and parked ‘bump impact’ notification feature in an array of online assists that include one that allows for car sharing with friends and family members. Embodying functions taken from S-Class models, the new B-Class comes with a plethora of driving assistance systems equipping it with one of the highest levels of active safety in this segment. These give the new B-Class an exemplary position in terms of accident avoidance, occupant protection and safety generally, including brake assist features. These can help prevent or mitigate the severity of rear-end collisions and impacts with crossing pedestrians or cyclists – one that many Irish motorists would be expected to welcome. For the first time, it can drive semi-autonomously in certain situations, employing improved camera and radar systems to anticipate traffic within a 500 metres distance. Powering the new B-Class are new, more efficient engines, all in compliance with new Euro 6d-TEMP limits mandatory on all new cars produced from 2020 onwards. Five engine variants will be available at the launch, two petrol (B180 and B200 ) and three diesel models (B180d, B200d and B220d ). Likely to be the most popular here will be the B180 petrol and B180d versions. With its 7G dual-clutch transmission, the 136bhp, 200Nm B180 has a combined fuel consumption of 5.6 - 5.4-litres per 100 km, and combined CO2 emissions of 128 - 124 g/km. The B180d, with its 116bhp and 260Nm performance, has a 7G dual-clutch transmission, combined fuel consumption of 4.4 - 4.1-litres per 100 km, and combined CO2 emissions of 115 - 109 g/km.